Have you ever had a fabric line that you just LOVE?! For me that is Bonnie & Camille’s Happy Go Lucky from several years back. It’s such a “happy” 🙂 collection of colors and prints that I was instantly drawn to. 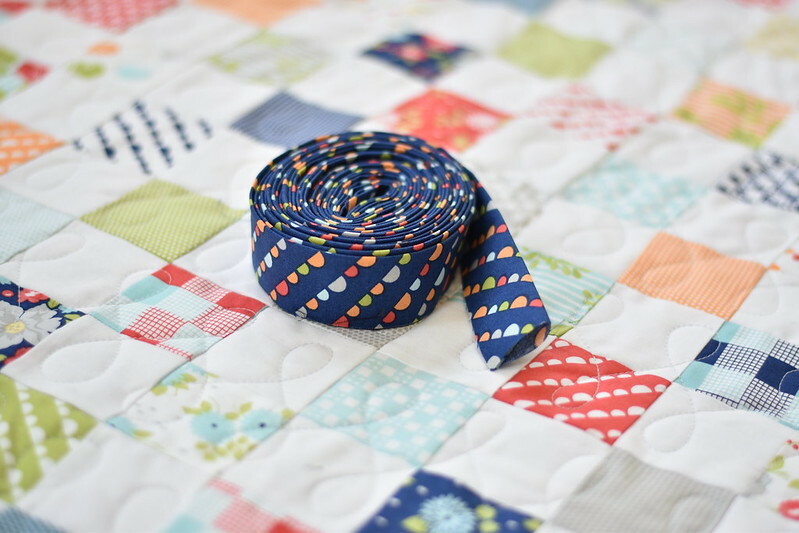 I snagged up a ton of mini charm packs when this line was released and paired them with 2 1/2″ white squares to sew together as leaders and enders between piecing on my other projects. 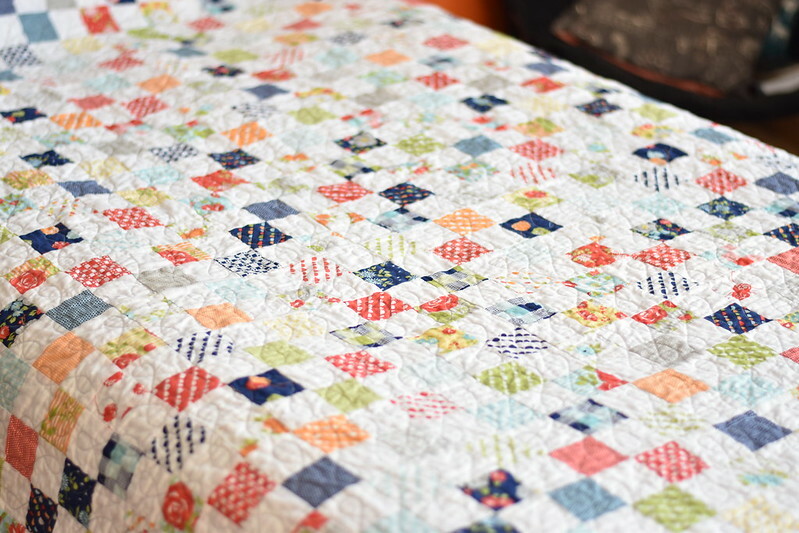 The end result (after a couple of years) is this adorable postage stamp quilt. It has all of my favorite colors: aqua, blue, green, red and orange. The fact that there is no pink or purple is probably why I love it so much. I know that isn’t really normal for most girls, but they are my least favorite colors. For the quilting I did a simple loop design using Aurifil 2600 in 50 wt. (my favorite). 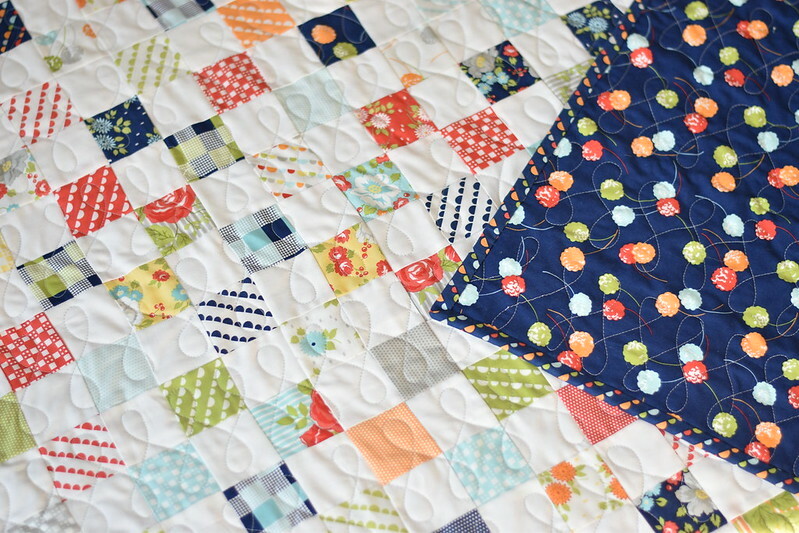 I hadn’t free motion quilted in a long time and was a bit rusty, but it turned out pretty well. I’m so very happy that I planned ahead and purchased this cutie bias stripe fabric for the binding. Isn’t it perfect? I also have been saving my favorite print in the collection for the back. I have big hearts in my eyes for this one. Those little pom poms are so sweet! 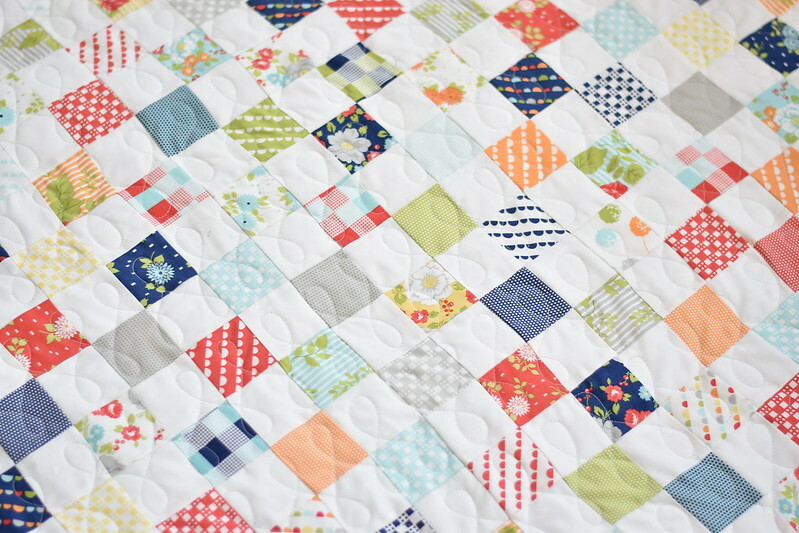 My new quilt labels look perfect with this quilt! This one has now been handed off to its new owner who I know will cherish it as much as I cherish our friendship. I love this! I have a few fabric lines that I love but have not purchased any yardage or cut goods. This would be the perfect way to make something with these fabrics. Your quilt is beautiful! Gorgeous colors! Smart move on that binding. Hi. I love your quilt. I too am making a postage stamp quilt with my leaders and enders. I’m hoping to be able to finish it this year. 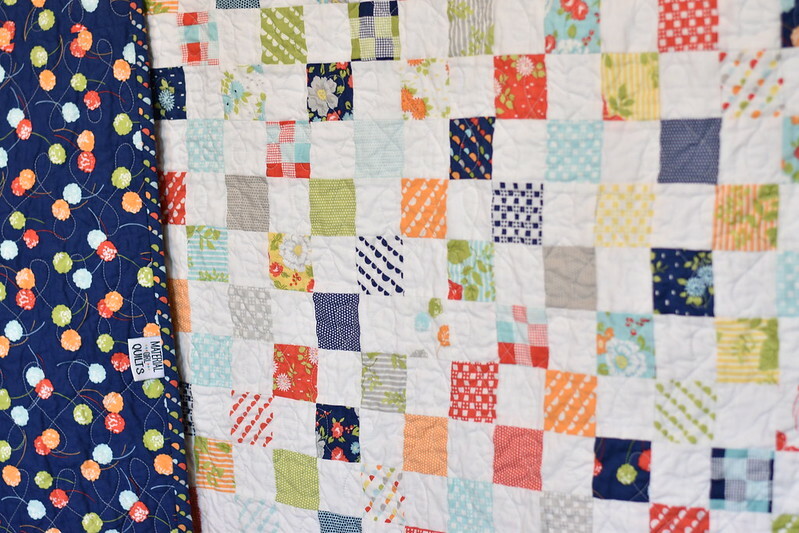 I have a question – Where did you get your quilt labels? Beautiful- I love the bright and cheery colors! 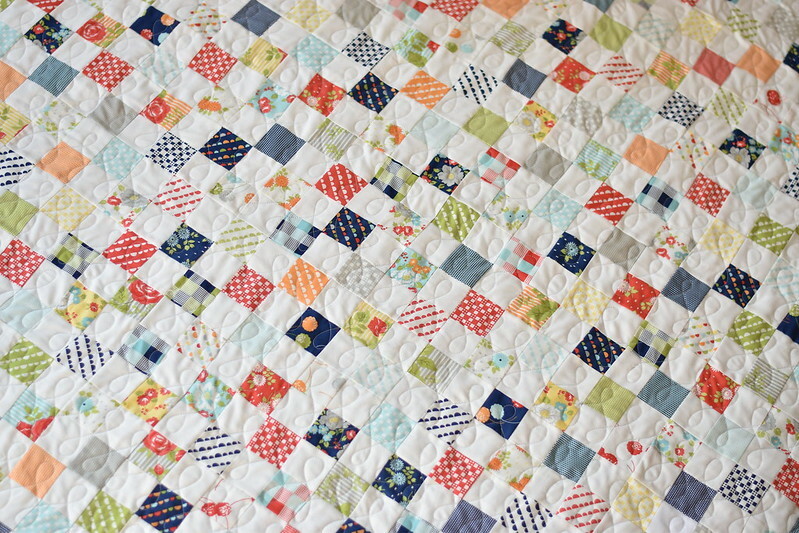 Beautiful quilt Mandy! What fabric did you use for the white background? Just how many is a ton of mini charm packs. I would love to make one like this. Amanda, I LOVE this quilt!!! Now I want one, too!! On the bucket list it goes!! A few questions: 1. Did you use a precut for the postage stamps and 2. What was your finished size? Ok – I see the answer to #1! !